Article and images (except as noted) by Sanja Martic, Rutgers Department of Landscape Architecture Graduate Student. The Dutch Room for the River Program (RfR) was conceived in 2007 as an integrated river basin management strategy for the low-lying flood prone and densely populated areas of the Netherlands. As part of this Program, water management is conducted via a specialized regional “Water Board,” working in partnership with the Dutch National Ministry and the Ministries for Transport, Public Works and Water Management. Through RfR the Dutch Water Board takes a four-pronged approach to water management. The four key characteristics of the RfR approach include: 1) large scale river region landscape architectural design thinking; 2) a focus on collaboration, with landscape architecture playing a facilitating role; 3) considering the landscape as a system of layers; and 4) anticipating that natural processes will change and enhance the design over time. 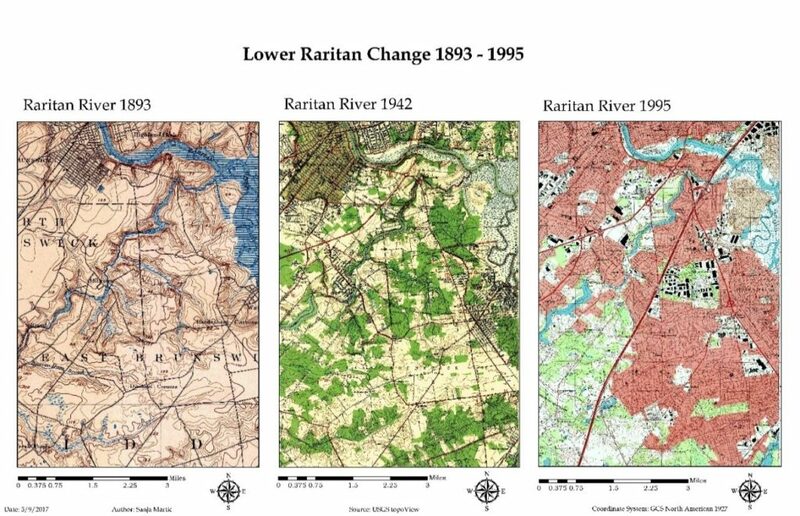 As in the Netherlands, significant portions of New Jersey’s Lower Raritan River are in low-lying densely populated areas. Flood protection is of paramount importance and a matter of human safety and economic security. However, the Home Rule focus of New Jersey’s local governance limits the potential for thinking in a landscape context, no comparable “Water Board” serves as coordinating entity for water management, flood control prioritizes human land use layers, and engineering controls trump considerations of natural hydrological processes and flows. There is much to learn from the Dutch RfR example. In what follows we provide background information on RfR, and consider the Dutch Water Management approach in the context of New Jersey’s Raritan River and Lower Raritan Watershed. In riverine areas around the world, the industrial revolution demanded capitalization of the river’s territory and its water. As a result, many river basins were heavily engineered: rivers streamlined, river basins minimized, and creeks and small streams culverted or replaced by canals. These practices, in combination with development over time, resulted in floodplains that restricted the river and required repeated heightening of flood defenses. There was no appreciation for the river ecosystems, and water was seen as a threat and as something that needed to be controlled. Over time, conflicts arose regarding use of the floodplain and the its water. And the Industrial Revolution and subsequent development left behind a lasting pollution legacy: abandoned infrastructure and degraded water and soil quality. Meanwhile, the expanding population’s need for potable water and space for a safe habitation increased, causing a decline in the river basin surface. In recent years, rising intensity and quantity of extreme precipitation events associated with a changing climate, coupled with increase of the impervious surface cover, further complicate water management issues. In the Netherlands, traditional water management methods were challenged following destructive floods in 1995, caused by record extreme precipitation events. It was clear that new flood levels required a different approach towards river management. Different approaches to water management call for different methods: many rely heavily on engineering while others emphasize a more natural approach. Room for the River Program (RfR) finds a middle ground. Instead of gradually reducing the area that rivers occupy, this approach allows the river to expand over a larger territory. RfR brings together the worlds of water management and spatial planning, engineering and ecology. Tools are varied and include dredging at one extreme, and measuring spatial quality on the other, and they are put into service of two main objectives: improving safety by reducing flooding of riverine areas, and “contributing to the improvement of spatial quality of the riverine area”. Although hard to quantify, this second goal is particularly interesting from the landscape architecture perspective as it considers quality of the space. Spatial quality within the RfR approach is defined as “a property of the resulting landscape after a plan has been implemented.” A good design is further judged by three criteria: hydraulic effectiveness, ecological robustness and cultural meaning and aesthetics. Cultural meaning and aesthetics criteria call for enhancing the scenic beauty, tailored to a range of sites that could be classified as natural, urban or countryside. Ecological robustness endorses designs that are long lasting, self-sustained, build upon natural processes, and are low maintenance. This is achieved through combining natural hydrology with morphological and biotic processes to achieve stability in riverbed and floodplain. This means that plans have to be functional in the case of floods, but at other times must accommodate livability, wildlife habitats and areas usable as a public good. Design is informal and natural while providing maximum access for recreation, with spaces intended to reveal the spirit of each individual site of intervention. In the Dutch model, spatial quality assessment requires development of a special Q-team (quality team) composed of members from different but complimentary disciplinary backgrounds. The Q-team’s role is to produce an independent recommendation on enhancing spatial quality through coaching designers and planners, peer review of the designs and plans, and regular communication to the Ministries of Transportation, Public Works and Water Management. This calls for significant transdisciplinary cooperation between planning and design, with an equal role for the landscape architect, urban planner, river engineer, ecologist and physical geographer. 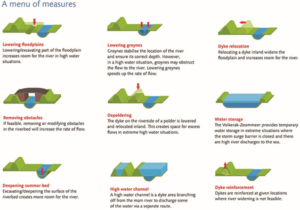 Practical measures (Figure 1) are applicable at large scale and fall into three categories ranked by complexity of integration of flood risk measures with spatial measures. These categories include technical measures (deepening the river bed, lowering groynes, strengthening dikes), measures within the banks (lowering the floodplains, removing obstacles), and measures beyond the banks (high-water channel building, dike relocation, water storage). In addition to evaluating project’s outcome, the team also evaluates the quality of the integrative collaborative design process. The RfR approach is not entirely new to the United States. An early similar effort was forwarded in New Orleans in 1927, following devastating flooding events in the Mississippi River delta. Like the Dutch who relied on dikes for flood protection, the Mississippi delta community relied on constant raising and enforcing levees, increasingly restricting the surface size of the natural flood plain. The 1927 flood prompted a reevaluation of the Mississippi River management approach. Official Congressional hearings were held and involved the U.S. Army Corps of Engineers, the Mississippi River Commission and expert witnesses such as Gifford Pinchot. Discussion revolved around engineered control of the river proposed by the Army Corps of Engineers, and an approach in which nature would be allowed more leeway supported by Pinchot, James Kemper and others. The latter view resembles the RfR approach as it calls for allowing more room for the river through widening the flood plain. The landscape architect plays a central role of coordinator between planners, architects and other partners. Fliervoet and Den Born studied and evaluated the RfR’s collaborative process from a stakeholders’ perspective. They concluded that the success of the approach is highly dependent on the cooperation and collaboration of multiple entities occupying the watershed with emphasis on the local knowledge. The biggest obstacles to collaboration stated by the participants, were the lack of an overarching, integrated maintenance vision and a lack of coordination between the authorities. Natural processes are expected to change and enhance design over time. The first characteristic, the large scale of design as applied to the Lower Raritan, requires creating a comprehensive masterplan with projects spanning the entire Raritan watershed. RfR site plans would become small parts of a large Raritan Watershed Masterplan. The masterplan would be guided by a comprehensive vision of integrated water management, with a regional greenway connection as an integral part. 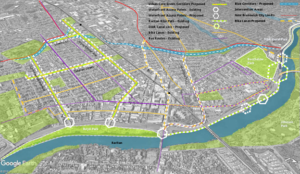 Directly connecting the City of New Brunswick to the greenway network would be a key component of the masterplan, as New Brunswick is the largest settlement on the banks of the Raritan River. Collaboration between many governing bodies is essential. At the federal level the governing bodies to involve include USACE, USCG and the Advisory Council on Historic Preservation. At a state level governing bodies to involve include NJDOT, NJDEP and Land Use Regulations and Ecological Services Field Office. Regionally the Delaware and Raritan Canal Commission and counties such as Middlesex, Somerset, Hunterdon and others should be involved. 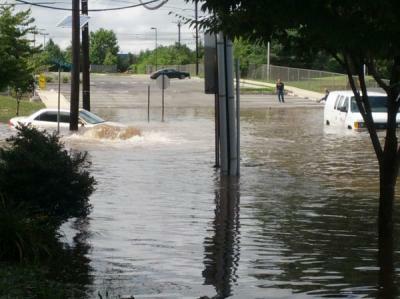 At the local level the municipalities along the Raritan River banks including New Brunswick, Piscataway, Franklin Township etc. would require representation. Large scale design requires examination of large-scale network connections. Analysis in the Raritan River context reveals several greenway network opportunities (Figure 2). Metropolitan areas of New York City and Washington D.C. are roughly framed by the Appalachian Trail to the North and the proposed alignment of the East Coast Greenway to the South. They are further enclosed by the major East Coast rivers that bisect the Trail and the Greenway on their way to the Atlantic Ocean. The Hudson River Valley to the East, the Delaware and Lehigh National Heritage Corridor, and the Chesapeake and Ohio Canal to the west all form a regional trail system matrix. This blue and green matrix provides unique opportunities for cross connections of the corridors and interactions with nature and culture to one of the world’s densest contiguous urban populations. The East Coast Greenway is an aspiring walking and biking route stretching the length of the US East Coast with southern terminus in Key West, Florida and northern Maine. 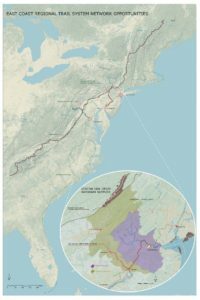 Once actualized, the East Coast Greenway will be 3000 miles long and epitomize the bond between communities and nature by connecting the exist green open space along its route into a unique linear corridor. Initiated in 1991, with forming of the East Coast Greenway Alliance, the vision of Greenway designers, “represents a commitment to public health, environmental sustainability, economic development, and civic engagement”. The existing Appalachian National Scenic Trail, which partially passes along New Jersey’s northern border, is currently the longest hiking footpath in the world at 2190 miles long. It was first proposed by a regional planner Benton MacKaye in a 1921 document titled “An Appalachian Trail: A Project in Regional Planning”. MacKaye’s vision initiated the idea of land preservation for the purposes of recreation and conservation. The idea started to materialize in 1925 and was actualized in 2014 when the last stretch of the Trail was formally acquired and protected. Today, the trail is visited by over 3 million visitors a year as it bisects fourteen US States from Georgia to Maine. The East Coast Greenway’s proposed alignment crosses the narrow waist of New Jersey using the D&R Canal Park as a major junction. 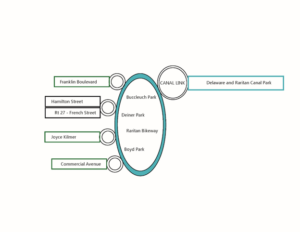 Canal Park’s Masterplan recognizes the most important quality possessed by this linear park to be the role it can perform as a connector. Canal Park no longer links New York City and Philadelphia, but it does join central New Jersey communities, different land forms and different kinds of natural areas, and connects New Jersey with its heritage. Extending the Canal’s connection back into the city of New Brunswick would align with the Canal Commission’s Masterplan and benefit New Brunswick’s future development. The Delaware and Lehigh National Heritage Corridor runs along the Delaware River on the Pennsylvania side, parallel to the D&R Canal Park. It is an indirect connection between the proposed East Coast Greenway, through the D&R Canal Park to the Appalachian Trail. It is also an example of a linear park run by a nonprofit organization, while Chesapeake and Ohio Canal is a linear park that is part of the National Park system. The Chesapeake and Ohio Canal is another significant connector between the Appalachian Trail and the East Coast Greenway close to a major metropolitan area. 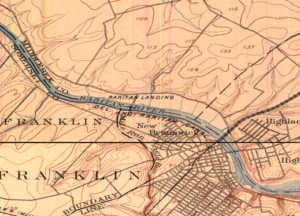 When the Delaware and Raritan Canal was built in the 1930s it permanently linked the Delaware and Raritan watersheds, creating opportunities for connection. Since that time, construction of Route 18 through New Brunswick, which established a several mile stretch of roadway immediately adjacent to the Raritan, severed this historic network connection, in particular in the area between Buccleuch Park and the Landing Lane Bridge. Today, the City of New Brunswick’s unique geographic position could once again benefit future development should access impediments to the D&R Canal Park be removed, resulting in expanded access to not only Canal Park but regional networks like the East Coast Greenway. There would be many mutual gains: the local community would have better access to nature and everyday recreation and day-hiking without having to drive to the trail. New Brunswick’s rich local history would add to the richness of the trail’s experience. The local economy would benefit from hiking and biking traffic generated by the Greenway. Finally, being a part of the future East Coast Greenway’s shared vision could be an invigorating driver of the nature stewardship and future community and economic development. 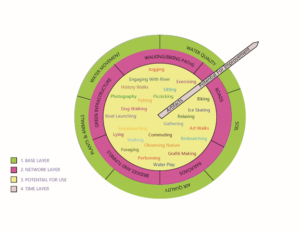 Collaboration and coordination, conducted by a landscape architect, may include working with a variety of professional partners on a local level. In addition to planners and architects, other professions to engage include social scientists, geographers, ecologists, river engineers, biologists, historians, archeologists and civil engineers. The RfR “system of layers” approach consists of a base layer, network layer, potential for use layer and time layer (Figure 3). 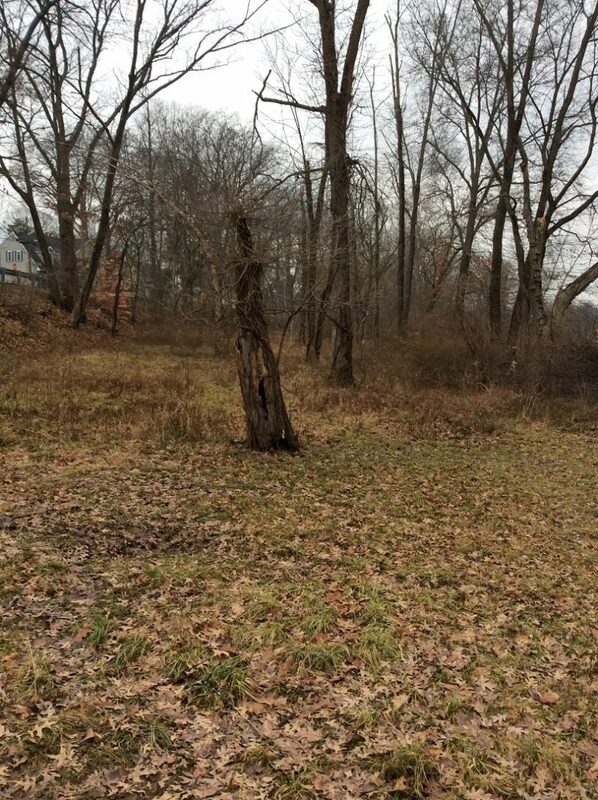 Layers provide a basis for site evaluation within the Lower Raritan. Expanding the original RfR methodology, we have conceived of each of the four categories of layers as worth 25 points for a total of a 100-point evaluation system. The lower the score for specific site, the better the opportunity for enhancing it. For example, considering New Brunswick in relation to the regional greenway network, the four areas identified as having the best opportunity for creating connections between the New Brunswick and regional greenways are the Key Connector Streets (Urban Core Green and Blue Corridors), Waterfront Access Points, Raritan Bike Path, and the “D&R Canal Link” (Figure 4). These] specific sites should then be evaluated for their soil, water and air quality within the base layer, and for the existing roads, railroads, bridges/tunnels, walking and biking paths and green networks within the network layer. The Network Layer evaluates the existing networks presence and connectivity. Points (0-5) are given for the presence of the networks within the site and more points for their current connectivity. All the sites have a presence of at least one network, however in some cases those networks are enhancing and in others reducing walking and biking connectivity. Increasing connectivity becomes a goal for this layer. The Base Layer evaluates the soil, water, air, plant and animal life conditions of the landscape. 0-5 points for soil quality are allocated depending on its permeability as well as its ability to support life. In the urban environment soil is often covered by pervious surface or is heavily compacted resulting in a low rating. Water movement is evaluated based on the speed of its movement within the site. Faster movement (poor infiltration) is rated lower. Water quality is associated with the ability of site to treat the stormwater runoff. Water that leaves the site cleaner results in higher points. Air quality depends on the site’s micro location. Sites near major roads with little vegetation are rated lower. Finally, existence of plant and animal life is rated depending on a level of presence. Based on the rating, design goals that emerge are: increasing surface permeability, slowing down runoff by retaining water in the landscape for longer periods, decreasing soil compaction, and creating conditions that support more plant and animal life. Our addition to the methodology also includes expansion of the “potential for use layer” by which each of these sites are evaluated for their potential to support any of 25 different activities that could take place within the area once it is redesigned. The Potential for Use Layer allocates one point for each activity that can currently take place within an area. The goal for this layer becomes increasing the number of future potential use of the space. Finally, the time layer evaluates presence of historic and cultural artifacts on one end and a potential for future ecosystem health improvement on the other. Sites that contain historic and cultural artifacts are rated higher, as well as the sites that will be able to, over time, enhance the ecosystem health. Ecosystem health is prioritized over the existence of historic and cultural artifact. For example, a city street has less potential for the improvement of the future ecosystem health than the river bank. The redesign of the existing key connector streets within the City of New Brunswick enhances the biking and walking experience, while leading to the waterfront access points. Commercial and Joyce Kilmer Avenues are green corridors, chosen for their proximity to the local schools, green open space, highest population density and wide traffic lanes. These two thoroughfares have a great potential for “road diet” interventions, such as narrowing traffic lanes and adding bumpouts at street crossings in order to calm traffic and thus enhance safety of pedestrian and bicyclists. They would further create opportunities for bringing nature closer to the local communities by becoming way finders for the Raritan River as well as the green corridors with more pervious surface and vegetation (Figure 5). Route 27 or French Street and Hamilton Street are already main routes of access that are further enhanced by adding new and improving existing bike lanes, and improving pedestrian experience by adding bump outs and lowering curbs. Similar interventions could be applied outside of the immediate study area. Franklin Township’s Franklin Boulevard is the next such opportunity. The existing Mile Run stream corridor, in conjunction with the key connector streets, forms a matrix of river connections. The Mile Run stream corridor is now accessible through this matrix, offering further opportunities for engagement with water and nature. Figure 7: Bumpouts add sidewalk space, provide space for rain gardens, bike parking, etc. and shorten crossing distance. Minimum width lanes slow traffic. Access to the waterfront is strengthened using various traffic calming techniques such as raised, textured crossings, lowered speed limit and narrowed traffic lanes. These approaches ensure safety and an enhanced pedestrian experience. Redesigning the Raritan bike path by adding access points, widening its surface, and adding small, localized interventions helps create a sense of place and wayfinding. Materials and forms chosen for intervention help to further connect community to the unique industrial and postindustrial history and ecology of the place. Finally, the “Canal Link” links fragmented biking and walking paths ending within the area of the River Road, Landing Lane, Buccleuch Park and Spillway, through an elevated walkway bridging the impediments. This walkway becomes the final interlocking link restoring connection to the D&R Canal Park, East Coast Greenway and the Raritan. Wiering and Arts, p 330. Rijke et al., “Room for the River.”, p 369. Rijke et al., “Room for the River.”, p. 369. Klijn et al., “Design Quality of Room-for-the-River Measures in the Netherlands.”, p 291. Klijn et al., p 292. Klijn et al., “Design Quality of Room-for-the-River Measures in the Netherlands.”, p 289. Ari Kelman, A River and Its City, p 190. Way, River Cities, City Rivers, p 376. Fliervoet, van den Born, and Meijerink, “A Stakeholder’s Evaluation of Collaborative Processes for Maintaining Multi-Functional Floodplains.”,p 185. D&R Canal Park Revised Masterplan 1988, p 32. Meet Mill Brook Streamkeeper Susan Edmunds! 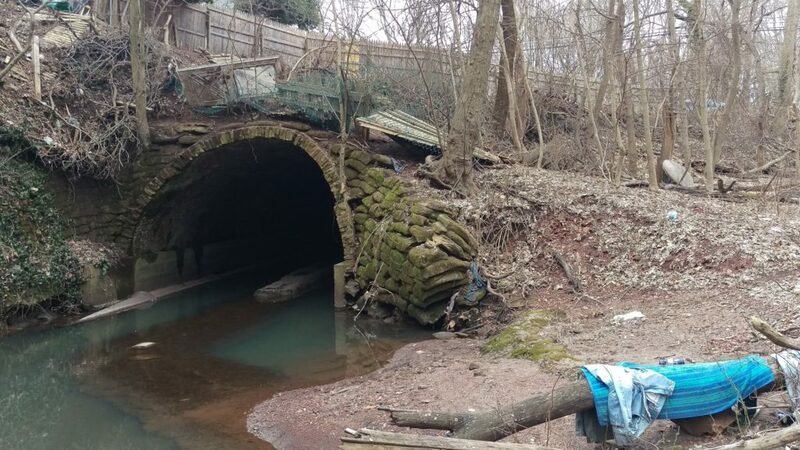 Highland Park resident Susan Edmunds is the first “Streamkeeper” for the Mill Brook, a tributary of the Lower Raritan Watershed. LRWP Streamkeeper Susan Edmunds, a 30 year resident of Highland Park, lives adjacent to a tributary of the Raritan River called Mill Brook. During the time Susan has lived alongside the Mill Brook, she has become committed to the environmental sustainability of this stream. 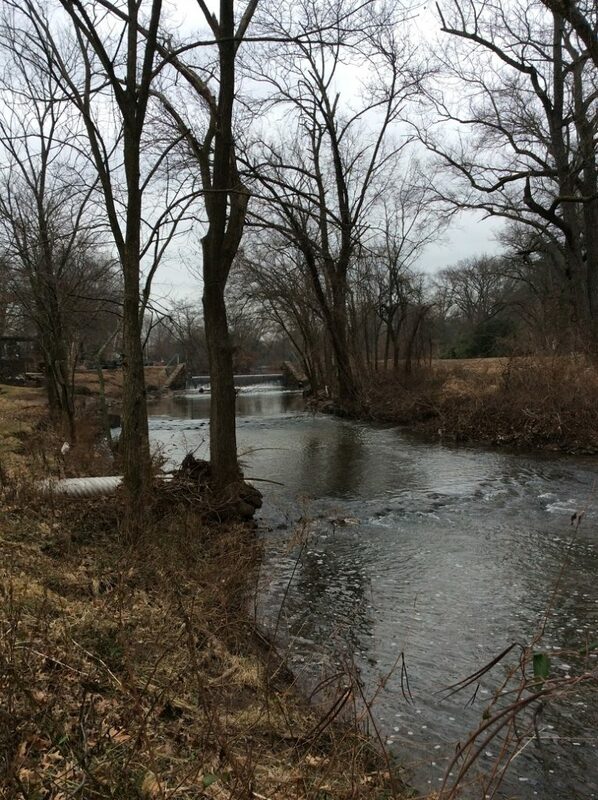 As part of a Rutgers Environmental Stewards program internship, conducted with the Lower Raritan Watershed Partnership, Susan documented the condition of the Mill Brook through historical research and photography, synthesizing this information in an online “storymap” titled Mill Brook: Portrait of an Urban Stream. Susan is a strong advocate for what she terms “a new understanding” by all stakeholders in order to remedy the serious threats which endanger the environmental viability of the stream. I walked along the waterway with her as she highlighted several major environmental challenges facing Mill Brook. These include illegal dumping of commercial and residential trash, and wash off of chemical herbicides and fertilizers from nearby lawns into the stream. This wash off is part of what is called “non-point source pollution,” and includes not just herbicides and fertilizers, but also animal waste, motor vehicle oil and other chemicals. As we continued walking downstream, Susan told me that in recent years Mill Brook has experienced intensified erosion and flooding events. She pointed out the proliferation of driveways, parking lots, and walls — what is known as impervious surfaces — that prevent the natural absorption of rainwater into the soil and results in “stormwater runoff.” She then explained how excessive amounts of stormwater runoff exacerbates erosion of lawns and damage to residential structures, and also carries downstream pollution in the form of silt and gravel and non-point pollution. 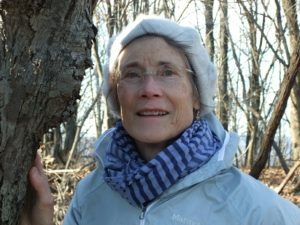 Even before becoming part of the LRWP’s inaugural team of Streamkeepers, Susan has long been committed to restoring the natural beauty of Mill Brook. She regularly removes debris from its banks, and replaces invasive plants with native flora. In her role as Streamkeeper she has added regular monitoring and reporting on stream health. She understands that while her isolated efforts are important, care of Mill Brook requires a long-term commitment by Edison and Highland Park residents as well as municipal authorities. Susan sees that inspiring a collective commitment to the health of Mill Brook is a crucial part of her role as Streamkeeper. Her goal is to encourage others to appreciate the Mill Brook as much as she does. She strongly believes that when residents learn about and visit the stream they will be motivated to care for it. In this sense she says she hopes her tenure as Mill Brook’s formal Streamkeeper will be short – and that her work will inspire someone else to become a steward and “Streamkeeper” of the stream. Susan gave me examples of other stewardship she would like to see. For example, schools in the vicinity of the Mill Brook should encourage students to participate in restoring the waterway. And homeowners and business owners who live and work in proximity to the Mill Brook should treat the waterway as the living system it is, and give it room to serve as flood control and to allow for native riparian habitat (not lawns!) to become established. Susan believes that small steps like these will not only help ensure the environmental sustainability Mill Brook, but of all of our endangered watersheds. The eternal waters of the South Branch flow with memories and reflections, kept safe for those who have opened an account along its banks and written their story upon its waters. I have a longstanding account, opened years ago, from which I make occasional withdrawals. The memories are recalled, polished with reflection and returned for safe keeping. Hazy events, prompted by a scrap of paper that fell from one of my books, brought a canoe journey made decades before, into sharp focus. 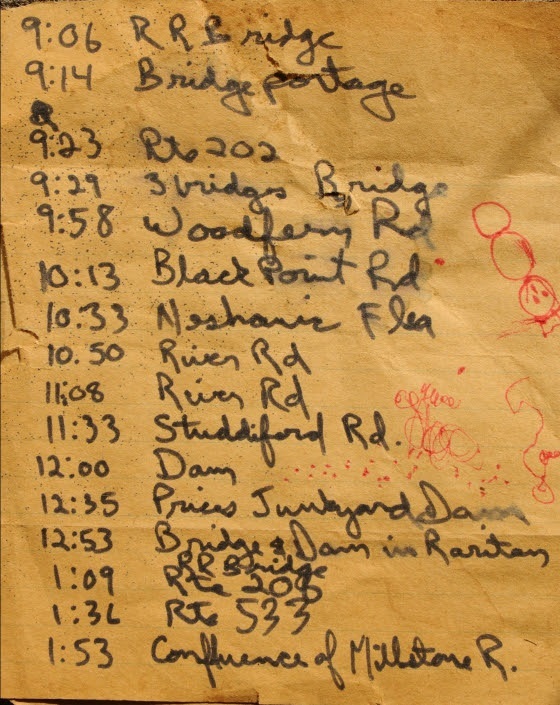 The lined, yellow paper, in my handwriting, was a record of time and places noted on a trip down the South Branch to the sea with my good friend Jim Serchio. Jim worked across the hall from me in the pharmacology department at J&J. Intrigued by my stories of paddling solo to the mouth of the Raritan River; Jim recruited himself to join me on another run to the sea. A hasty plan was hatched and a day chosen. We would launch from Main st in Clinton and paddle down to Keasbey. 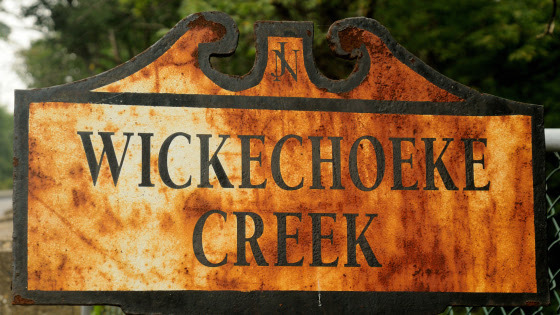 I would then walk to ‘Billy Vack’s Loop In’, an old iron workers bar located under the Parkway bridge, phone my brother-in-law, and get a ride in his pickup truck to my parent’s home, about three miles away. The chosen canoe was my old canvas covered 1910 Old Town OTCA 16 named the “Wild Turkey”. Now stripped of canvas and covered with fiberglass, the hull was painted a flat, dead grass green and weighed in at about 85 pounds. No cooler, just a couple of blue cushions and two guys in the canoe headed downstream. Jim was brilliant guy, studying biomedical engineering. I suppose it was his scientific inquisitiveness which finally prompted him, once we were underway, to ask, how long would the trip take. In my best carefully calculated estimation, I answered, “pretty much all day, we should be there before dark”. 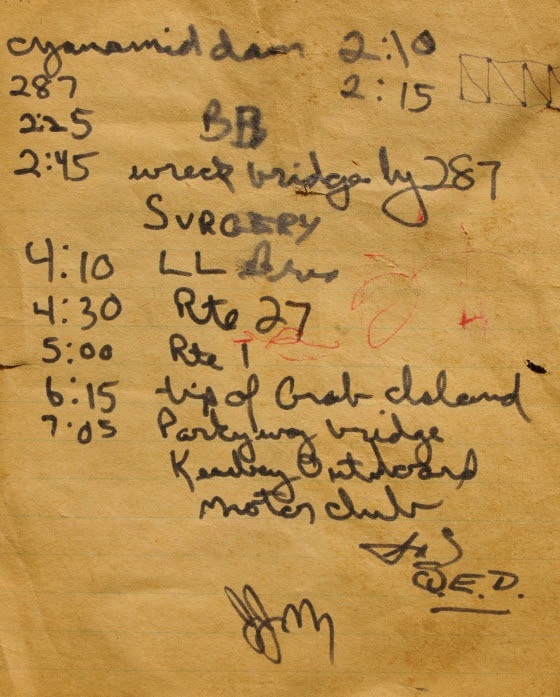 As we passed under interstate 78, just after launching, I noted the time on my scrap of paper. Every time we passed a landmark, clock time was recorded. Route 202 was reached at 9:23 am. Looking over the sequence of shorthand notes, I now realize we had paddled under and over landmarks that are now gone or restored differently from their original form. Many of the metal bridges have been reconstructed over the years, their fieldstone supports now replicated by fieldstone veneer. I counted five bridges between Clinton and rt 31. The old dam we portaged below Dart’s mill is now essentially washed away. One bridge downstream of Neshanic station was not yet constructed. The scenery on the same trip today would be quite different. One entry made at 2:45 just before the second downstream pass under interstate 287 makes me smile; I wasn’t smiling then. I recorded the word ‘surgery’. There was the wreckage of an old wooden bridge just before the last pass under I 287. It blocked our passage so we had to go up and over. As we set the heavy boat down on the rough planks, we did not see a huge spike that punctured the hull below the water line on the starboard side. The situation was looking grim as we were about to enter tide water on the last six hours of the trip. This meant navigating a running tide and staying clear of the main channel to avoid the large wakes churned up by tugboats and deep hulled pleasure craft. Undaunted, we set the boat back in the water and began down river to see how bad the leak was. It was bad, real bad. How were we possibly going to finish. Pulling to shore, we looked around the debris, left by high tide, for a possible solution. Seeing a piece of yellow polypropylene rope, I had a flash of brilliance. As a kid I loved playing with fire, burning all sort of material including little plastic soldiers. The drops of melting plastic would quickly cool to form rock hard globs and even make a neat hissing sound as it dripped. On a hunch, I took the piece of rope, set it ablaze and dripped the plastic into the large hole in the hull. A perfect watertight fit and we were on our way. At 4:30 we passed under rt 27, the low water encountered from 287 to Landing Lane Bridge road really slowed our progress. Now we had to deal with the wakes of large watercraft, which showed no mercy to two guys in a canoe. The resultant waves forced us to divert course, turn the bow into the wake and then re-correct to head downriver. We passed the old drydock across from Crab Island at 6:15 and finally reached our destination under the New Jersey garden state parkway bridge, the former site of the Keasbey Outboard Motor Club, at 7:05pm. While Jimmy entertained the bystanders, I headed up to Billy Vack’s to call my brother-in-law. When I returned to the boat and Jimmy, someone asked where we put in. We were actually embarrassed to say, Clinton. We figured they wouldn’t believe us. Our ride soon arrived and we could finally relax. We did it! Paddled from the NJ highlands to the Mouth of the Raritan river in about 12 hours in a 1910 Old Town canoe pressed into service for an epic journey to the sea. Jimmy passed away a few years later from a medical procedure gone badly. 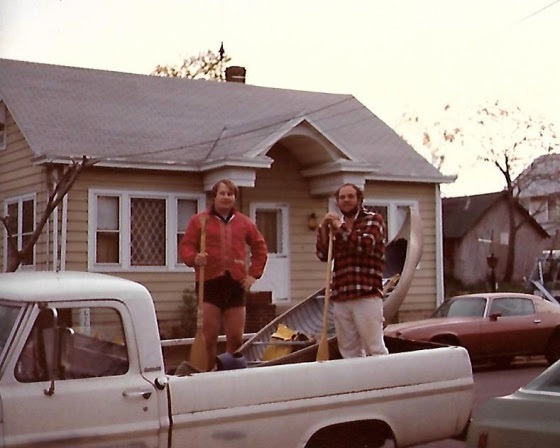 I still have the canoe and think fondly of the epic river journey shared with my good buddy Jim. The diary of times and places serves as a reference for memories and the ever changing river landscape. Two of three pages from the ship’s diary, documents the journey of “The Wild Turkey” and its crew, serves to sharpen the memory of a dash to the sea by two friends in a turn of the century canoe. Along the South Branch: Connected! Bear have no need to read signs, much less pronounce the names of obscure creeks, to figure out where they are going. They just put one foot in front of the other and see where it leads. Two yearling bears curled up to sleep in a jumbled embrace, to form a single pile of pulsating fur, from which random legs protruded. Upon waking, one bear walked downhill 500 paces to its right, the other 500 paces left, each bear seeking to satisfy its thirst in the nearby streams. Rested and full of adventure, thirst satisfied, both bears began to follow their respective stream in the direction the water flowed. The two streams, arising from springs, on each side of a common ridge, a mere half mile apart, lead to the state’s opposite coasts. Together the streams form a direct pathway from coast to coast. We live in a provincial world defined by geopolitical borders, reinforced by the scale of our self-imposed home range. When we travel US route 1 in New Brunswick, we never consider that if we go straight, instead of turning into Chipotle, we end up in Caribou, Maine or the Florida Keys. Same situation as the two bears. Whether tracing the tracks of a rambling bear down a watery trail to the coast, or a paved highway to opposite ends of the continent, we begin to see a connectivity to distant places. Artificial borders fall away and perspective comes into focus. Taken to the highest resolution, we see that celestial events in the cosmos dictate the requirements and conditions for life on earth. Adjust the resolution and closer to home we see the Atlantic flyway, a major bird migration route from the arctic to Mexico. Events at either end of the spectrum and along the flyway, can have a dramatic impact on population dynamics of many species. Preserved lands like the Rachael Carson National Wildlife Refuge in Maine and the Edwin B. Forsythe National Wildlife Refuge in New Jersey are just two of many areas critical to migrating, nesting and overwintering avian activity. Private lands cannot be overlooked and must be appreciated for their valuable contribution outside established state and federal refuges and wildlife management areas. On a smaller scale, though still expansive, is the critical need for linear greenways in an area broken into isolated segments of habitat. Many reptiles, amphibians and furbearers are impacted. Isolated populations require a critical amount of genetic variation to remain viable into the future. Slow moving turtles such as the bog and eastern box turtle are especially threatened. They are now exposed to predators and cars on their journey to lay eggs or migration forced by habitat loss. To celebrate the establishment of isolated patches of open space is misplaced, if a pathway is not considered. Concerned with isolated habitat and lack of greenways connecting them, the State of NJ, Dept of Environmental Protection, Natural and Historic Resources, Div of Fish and Wildlife, has established a program to examine the impact of isolated habitat and genetic variation. Their program is CHANJ- Connecting Habitat Across New Jersey. Far away places exist only in our limited imagination, programmed with a distorted sense of scale. Put one foot in front of the other and see where it leads. Did you all get caught in the snow squall yesterday? Leaving Rutgers campus at 3:15 PM I traveled a good half mile in near white out conditions on Route 1 North. Skies cleared at about 3:40 PM, just as I started on the Goodkind Bridge across the Raritan River. There was no precipitation at all as I traced the path of a salt spreader for the length of the span. In fact, the squall was the result of a very narrow band of precipitation and lasted a mere 25 minutes. It left just .02 of melted snow in our gauge. Salt trucks are loaded with 12-15 tons of salt, and spread rates are about 400 pounds per lane mile of roadway. In the time I was behind that truck – the quarter mile or so across the bridge – approximately 100 pounds of salt was spread on one roadway lane. This was after the snow had stopped. A new study released January 23, 2018 by University of Maryland researchers is the first to assess long-term changes in freshwater salinity and pH at the continental scale. 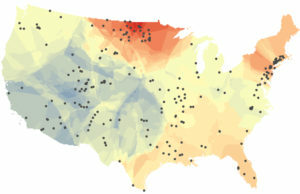 Drawn from data recorded at 232 U.S. Geological Survey monitoring sites across the country over the past 50 years, the analysis shows significant increases in both salinization and alkalinization. The study results also suggest a close link between the two properties, with different salt compounds combining to do more damage than any one salt on its own. This map shows changes in the salt content of fresh water in rivers and streams across the United States over the past half century. Warmer colors indicate increasing salinity while cooler colors indicate decreasing salinity. The black dots represent the 232 US Geological Survey monitoring sites that provided data for the University of Maryland study. Image credit: Ryan Utz/Chatham University. The results of this “freshwater salinization syndrome”? Infrastructure corrosion, contaminant mobilization, variations in coastal ocean acidification caused by increasingly alkaline river inputs, and significant impacts on ecosystem services such as safe drinking water, contaminant retention, and biodiversity. Simply put, fish and bugs that live in the Raritan River and our freshwater streams can’t survive in extra salty water. And while almost all of us in the Lower Raritan depend on local streams for drinking water, water treatment plants are not equipped to filter out the extra salt, so it ends up in tap water and corrodes pipes. Road salt is everywhere during winter months. It keeps us safe on roads and sidewalks, but it can also pose a threat to fish and wildlife as well as human health. Of course we want to keep our roadways safe. We also must ensure that any salt spreading be conducted utilizing best practices for sustainable use, which includes calibrating salt spreading in accordance with weather forecasts and minimizing the amount of salt spread over sensitive habitats. There are things you can do to help us better understand the impacts of road salt on our local environments. The Cary Institute of Ecosystem Studies presents several best management practices in their new report: “Road Salt: The Problem, The Solution, and How to Get There.” One key recommendation is identifying areas for low or no salt application. That is, basically creating a buffer of “no salt zones” around any water body. This report also identifies substitutes for road salt, and their relative impact on our waterways. And the Izaak Walton League is recruiting volunteers to help measure salt levels in area streams to gauge the extent of salt spreading impact. With the information they gather they will be able to develop a targeted and prioritized approach to reduction of salts in local and national waters. The Izaak Walton League requires a simple registration process, after which participants receive a free chloride test kit. The kit includes test strips and instructions to measure the chloride level in local streams, then report out findings in a national database. 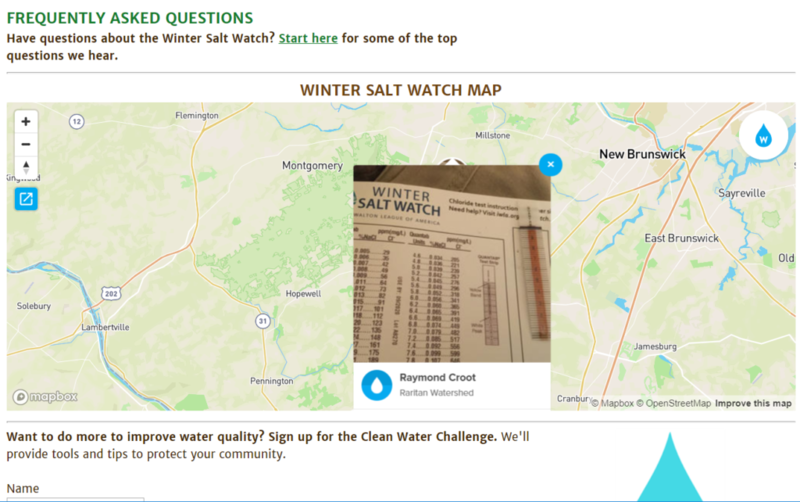 Dedicated Lower Raritan Watershed volunteer Raymond Croot is the first to submit “winter salt watch” data for a Lower Raritan stream. Through his leadership of the civil rights movement, Dr. Martin Luther King provided tremendous service to our nation. Despite this, media coverage of the service aspect of Martin Luther King Day celebrations is sparse. Especially rare are stories that highlight impacts of volunteering that go beyond economic valuation and personal benefits. How can we build on Dr. King’s legacy and celebrate volunteering in ways that strengthen our neighborhoods and nation? We can conceive of service as an expression of citizenship, service as an expression of generosity, and service as the opportunity to experience a felt sense of community. Citizenship. The pressures of our day-to-day political and economic engagement tend to reduce us to “voters” or “consumers.” Through this process we lose sense of ourselves as citizens, and lose connection to our communities. Volunteering allows us to connect deeply with one another as citizens in the craft of working together for the common good. Generosity. Non-profits, schools and nursing homes do not need “free labor” or “spare time” as much as they need the generosity of spirit that prompts us to engage as volunteers. In sharing our generosity, we are held to a higher standard: the intention to enhance the true well-being of those to whom our generosity is given. Community. Volunteering is about a felt sense of community. It is about making connections and building resilience. 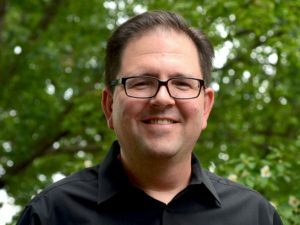 Connections, resilience – these are especially critical assets in these more trying times. As we recognize 25 years of celebrating service as a national value, let’s reflect on and commit to grow through the broad benefits of volunteerism. Evolving through service in this way can help strengthen our diverse communities and further protect civil rights and civil liberties. Heather Fenyk, Ph.D. serves as Board President of the 100% volunteer-run Lower Raritan Watershed Partnership based in New Brunswick, NJ. The Lower Raritan Watershed Partnership is often asked to talk about the most pressing environmental issues facing our Central Jersey watershed communities. Here is our “Top 10” list of cross-cutting concerns for 2019. Starting in February we will feature one concern a month on our website, exploring that issue (and potential solutions) in more detail. We invite you to join in the conversation. 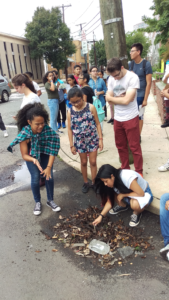 Poorly coordinated stormwater management, conducted at municipal (not watershed) scales, means that one community’s flood control efforts can lead to another community’s flooding problems. Centuries of burying and culverting streams has “disappeared” many waterways, compromising the ability of our landscape to adequately capture and store rain and stormwater runoff. Perceptions of safety (poor lighting, litter) around riverfront spaces, and poor signage and access to these spaces, deters use and enjoyment of our waterways. If we don’t know our rivers and streams we won’t grow to love them and act to protect them. Failure of aging water infrastructure (culverts, pipes, inlets and outfalls), an urgent safety issue for all our communities, is exacerbated by an increase in precipitation due to climate change. Poor control of non-point pollution sources (fertilizers and pesticides from lawns, sediments from development and erosion, oil and grease and road salt from roadways, animal and human waste, dumping of detergents and paints and other chemicals into stormdrains, and litter) results in high chemical levels, bacteria loads and algal blooms in our rivers and streams. Loss of biodiversity in our watershed, and a reduction in absolute numbers of insects and flora and fauna, reduces the ability of our ecosystem to cope with threats from pollution, climate change and other human activities. State and regional authorities do not have a clear plan to improve knowledge of the health of the Raritan and its tributaries, and do not model pollutant loads for our watershed. Recent federal rollbacks of requirements for oil and gas reporting may result in increased methane emissions and open the door to more pipelines that fragment and threaten habitat. Federal policies that extend the offshore fishing season and increase allowances in catch rates for commercial fishing reduce numbers of anadromous migratory fish in the Raritan, affecting the food chain. Limited regional cooperation, a “home rule” focus, and lack of collaborative action and capacity building results in a slow pace of restoration and improvements in our watershed. Check with your local Environmental Commission or Green Team for information about specific source impacts and development pressures in your community. As my year-long project entailing the assessment of the Ambrose Brook is now drawing to a close, I wanted to make one last observational visit to the site, which I completed on 31 December 2018. As I was driving over, in my mind I reviewed the year and wondered, at this point in the process, if there would anything more or new that I could possibly say about the Ambrose Brook. Well, was I in for a surprise, and a most captivating one at that! I arrived at just about 10:30 am, I was the only human around, and as I traversed the eastern side of the stream, I spied just one pair of mallards afloat on the lazy, meandering brook. The male’s plumage was blatantly obvious against the muddy, slow-moving current, whereas the female’s was camouflaged just about perfectly with the background: muddy water, brown earth, fallen leaves. The sky was overcast and the air was calm with a moderate 40 degree temperature that provided a welcome and silent capsule for my period of observation. My goal was to walk the bank, if possible on both sides, from a bit past the small waterfall all the way back to the footbridge and back again. And with this trajectory, nature provided me with a series of surprises. As I made my way south on the eastern side of the brook, a veritable flock of mallard pairs came into view, comfortably resting on the water’s surface, the first that I have seen in the entire year. They gave me a slight if sneering glance, then turned away from me to glide closer to the western bank. Secondly, as I walked along the bank farther and farther from the street noise, I noticed that several trees had a distinctive series of marks along the base up to about one foot, all around the circumference of the trunk. I am not a naturalist, but I wondered if by any chance it could be a family of beavers at work. “Nah”, I said to myself, this place has too many people around, “no way”. Well, I suspect that I was proved wrong! At another spot, a neatly chewed tree, gnawed to what looked like a precise pencil point, had been felled and now was lying in the water, the severed trunk just inches from the sad looking stump. 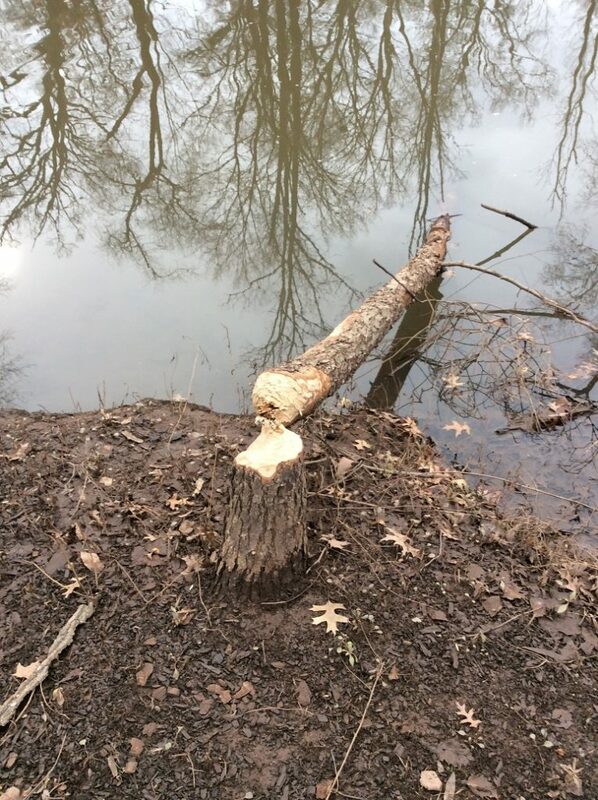 “Aha!” I exclaimed, “nature wins again, beavers’ resourcefulness as effective or more so as a mini-chainsaw”. I never did see any beavers but their handiwork was a very good indicator of their presence. At the farthest point away from the street, still on the eastern side of the brook, felled trees were piled up very close to the water’s edge, and I wondered whether that might be an indication of a lovely and cozy den. Hmmmm…..
After crossing the footbridge to the western side of the brook, I was presented with another of nature’s surprises. Now that winter is officially upon us and foliage has died back both above my head and below my feet, I was able to make my way about three quarters of the distance to the small waterfall. As I walked among the brown brush, fallen branches, and dormant grasses, it dawned on me that the brook had on this western bank a lovely and wide flood plain well below street level that I had never noticed before, given the presence of a daunting array of vegetation, including some very fierce brambles that had heartily discouraged my passage in previous visits. Wow! Talk about hiding in plain sight! I presume that this flood plain accepts the surplus of storm water that occasionally overflows the banks of the brook, which is then absorbed into the ecosystem, but in turn does not flood area streets … or basements. Nifty! West Bank flood plain, Brook is to the right, street to the left. And two last affirmative surprises. Having crossed over once again to the eastern side, I noticed yet another storm water outlet that fed into the brook, close to the small waterfall. I had never noticed it before because of the verdant camouflage offered by the grasses that were presumably fed by its generous flow and overflow. It was right there all the time, but I had never seen it. It humbled me and made me smile – in this visit, I suspect that nature, anthropomorphized to be sure, was having a good chuckle at my expense because of my naiveté. To think that there would be ‘nothing more to see’ was pure hubris and I was given my comeuppance. In addition, the waterfall also had a surprise. Even though the water continues to flow, it was evident that it was starting to freeze at the base! The clumps of white ice shone unmistakably through the tumbling current, a solemn reminder that winter is upon us. I would have missed it if I had not walked closer to the waterfall than I had ever done on previous visits. Waterfall view in winter. Great for a contemplative moment. The last surprise was not a very happy one. As I made my way on both sides of the brook, I took note of several places where the water was almost completely stagnant, where the current did not have the opportunity to lend an active, cleansing presence. And in those small culverts at the water’s edge, I noted that the water kept a glaze of oil slick of who knows what composition. At first glance I had guessed that the water might be beginning to freeze, but upon closer inspection, the real reason for the discoloration was obvious: water pollution of a chemical nature. Ugh. So this was my visit, a combination of wonder and despair. I plan to offer in the coming weeks one last report, an estimation of the year’s trajectory as applied to my original proposal for this project. Happy New Year, everyone! May nature be your guide and live in your heart.